​An astronaut aboard the International Space Station (ISS) took this oblique photograph of one of the large volcanoes found in the central Sahara Desert. Emi Koussi is the dark crater and cone occupying most of the image. The dark lavas erupted from the volcano contrast with the surrounding light-toned sands and bedrock. For scale, the Emi Koussi crater is 12 to 15 kilometers wide (7.5 to 9.5 miles). Canyons, which were eroded by rivers and streams, radiate down the slopes. Click here for an earlier photo of the crater depression. 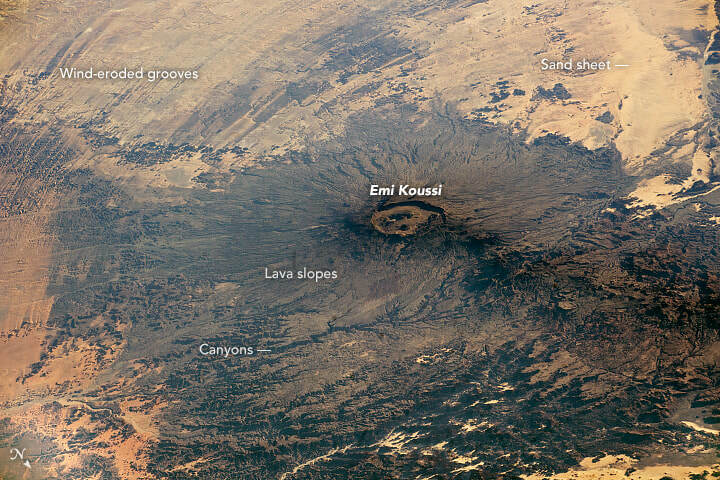 The Emi Koussi cone rises so high above the surrounding plains (2300 meters or 7,500 feet) that it deflects the dominant winds, which curve around the mountain mass. The lack of vegetation in the desert allows these persistent winds to erode long grooves in soft rocks—geologists call them yardangs. The grooves can be 30 meters deep and up to tens of kilometers long, and they reflect the dominant wind directions. Emi Koussi is one of a line of volcanoes trending north in the range known as the Tibesti Mountains, which are often photographed by ISS crews. Travel across this countryside is known to be extremely difficult due to the challenging terrain. Astronaut photograph ISS053-E-131330 was acquired on October 22, 2017, with a Nikon D4 digital camera using a 240 millimeter lens, and is provided by the ISS Crew Earth Observations Facility and the Earth Science and Remote Sensing Unit, Johnson Space Center. The image was taken by a member of the Expedition 53 crew. The image has been cropped and enhanced to improve contrast, and lens artifacts have been removed. The International Space Station Program supports the laboratory as part of the ISS National Lab to help astronauts take pictures of Earth that will be of the greatest value to scientists and the public, and to make those images freely available on the Internet. Additional images taken by astronauts and cosmonauts can be viewed at the NASA/JSC Gateway to Astronaut Photography of Earth. Caption by Justin Wilkinson, Texas State University, JETS Contract at NASA-JSC.